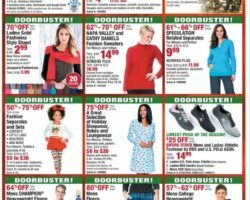 Boscov’s Weekly Ad & Sales. Check out this week Boscov’s Ad sale prices, printable coupons, current circular savings and latest specials. Boscov’s is a full service department store with a broad range of name brand fashion items and an extensive line of home furnishings. Brands they carry include Skechers, Keurig, Nautica, Calvin Klein, Kenneth Cole, Nike, Nine West and Cuisinart. The company operates traditional, brick-and-mortar stores and an online shop with various delivery options, including free standard shipping with purchases $99 and more, free standard shipping with $49 purchases, or free shipping with no minimum purchase required during shipping offer promotions. Boscov’s offers a number of ways to save on popular brands starting with online exclusive deals and hot buys. They often provide an extra up to 15% off select amount purchase with promo code and send special offers to newsletter subscribers. Boscov’s weekly promotions can include anything from 40% off new fashion arrivals and discounted full size vacuums to up to 75% off accessories like spring handbags, loop scarves, assorted knits and gloves.